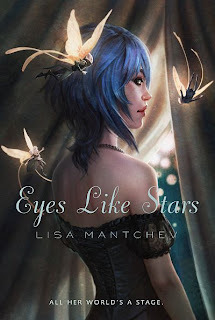 YA Highway contributor Kristin Briana Otts had the opportunity to interview Lisa Mantchev, whose AMAZING YA fantasy, EYES LIKE STARS, came out a few months ago. She's in love with this novel and eagerly awaiting the sequel, so it was exciting to talk with Lisa. KB: Describe your novel in twenty words or less. LM: Beatrice Shakespeare Smith lives in a magical theater with all the characters from every play ever written. KB: Where did you get the idea for EYES LIKE STARS? LM: ELS started life as a short story entitled "All Her World's A Stage" and THAT started with Bertie's full name... it just popped into my head one day as I was writing something else entirely. KB: It's a GREAT name. :) Do you usually try to follow an outline or are you a "pantser"? LM: A little of both... I outline, and then wander all over the place as I work through a first draft. Some of my favorite scenes were never part of "the plan"... like the Tango Scene. That was inspired by a season past of So You Think You Can Dance, something I was watching in the evenings to decompress after a day of putting down new words. LM: The Players just showed up... the fairies, Ophelia, and Ariel all arrived as-is, with their personality quirks and in full costume, ready to go. Nate turned up in a revision, when the Sea Goddess/scrimshaw plotline was added in. KB: I am SO glad Nate found his way into the cast. *hugs Nate* Can you tell us the story of that first call from both your agent and editor? KB: Do you listen to music while you write? LM: Anything I could say about Perchance To Dream is a spoiler for Eyes Like Stars, so I'm waiting for the Official Book Jacket Copy to share anything about book 2. Sorry!! KB: Dang it. *pouts* Oh well. I guess I can wait for next year. :D Last but not least - what is your favorite flavor of jelly bean? Thanks again for the interview, Lisa, and for your awesome book!!! Learn more about Lisa and the players of the Theatre Illuminata at www.theatre-illuminata.com. Oh, this looks so amazing. I had an idea for a Shakespeare-inspired novel a few years ago, but this sounds so much cooler. Awesome! Why haven't I read this book yet?? Nice interview, Kristin Jr.! I've been looking forward to this book for a couple of months. It sounds great!